1. For the brine: place 1 litre of the water in a pan and allow to come to a boil. Add the salt and whisk until fully dissolved. Remove from the heat and add a further 1 litre of water. Allow to cool completely. 2. Place the brine in a container, add the ribs and place a lid on top. Place the ribs in the fridge for 1 hour. 3. Meanwhile, mix together all of the marinade ingredients, except the ginger, and place in a bowl. Once the ribs have been brined, place them in the marinade (covered) and in the fridge for at least an hour. 4. Transfer the ribs into a pan with the marinade, allow to come to a boil and reduce to a simmer. Cook for 1 hour or until tender. During the last 20 minutes of cooking, add the chopped ginger. 5. 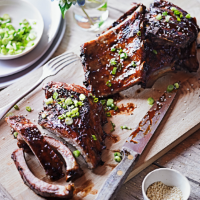 Finish the ribs on a hot barbecue for 5–10 minutes, and brush regularly with the thickened marinade. Remove the ribs from the barbecue and sprinkle with the sesame seeds and salad onions before serving.